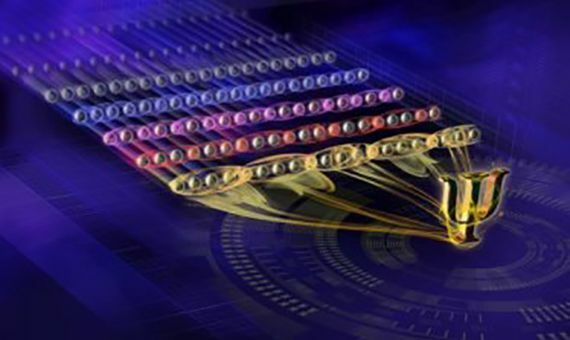 Quantum computers are called to revolutionize computing. Their ability to perform impossible operations turns them into a kind of Holy Grail and has unleashed a competition that, for the moment, the United States is leading. Europe and China, which lack the industrial muscle of the U.S. with its companies like Google or IBM, are also struggling to achieve this desired technology. The main difference between a quantum computer and a conventional one is the way it processes information. While classical computers do so in bits, and each one takes the value of 1 or 0, quantum computers use quantum bits (or qubits), which means that they can represent both a 1 and a 0 at the same time. They correlate with each other, i.e. the value of one can depend on the value of another, which is known as quantum entanglement. This revolutionary way of processing information imitates nature in its smallest ways. Particles and other tiny elements behave strangely, acquiring more than one state at the same time and interacting with other particles that are located far away. Their behaviour is governed by the laws of quantum mechanics. By simulating these interactions, quantum computers will perform very complex operations and solve problems that traditional computers don’t have the capacity to solve, such as the calculation of factors of giant numbers or the precise study of interactions between atoms and molecules. It’s expected that areas such as new materials, the development of new drugs or artificial intelligence systems will advance at an unprecedented speed with the help of this new type of computation. Although several quantum computer models already exist, no one has yet developed one that reaches 50-100 qubits, with capacities that surpass those of classical computers. Last year, IBM claimed to have reached 50 qubits, but experts are cautious because the company’s researchers did not explain the details in any scientific journal. For its part, Google claims to have achieved a technology with 72 qubits. “This has nowhere been achieved, however, we will probably see this within the next few years,” adds the scientist. The United States leads the race to obtain this Holy Grail of computing. Along with the research carried out in universities and other centres, the push by companies such as IBM, Google, Intel and Microsoft allows them to lead this field ahead of Europe or China, as Raymond Simmonds, researcher at the National Institute of Standards and Technology (USA), confirmed to OpenMind. Although Europe contributes 50% of the scientific articles on quantum information from around the world, “in the development of the quantum computer we’re falling behind because of the lack of investments and participating high-tech companies,” admits Blatt. To avoid losing its position in this race, the European Commission will invest around one billion euros in the Flagship on Quantum Technologies program, an initiative that will last for ten years and whose main objective is to consolidate and expand European leadership and scientific excellence in quantum research. Along with Europe and the US, Japan, Australia, Canada and China are also betting on this type of computing. Chinese scientist Pan Jian-Wei, considered the father of computing in his country and chosen by Nature magazine as one of the most important researchers in the world last year, explains to OpenMind about the situation in China. “In the quantum computer field, China has made a lot of significant progress, however, as a whole it still needs more effort to become one of best in the world,” admits Pan, who researches at the University of Science and Technology of China. Other powers such as Russia or Israel are also investigating this technology, although the experts consulted do not place them at the top of the list. In Pan’s opinion, to be first in this race, it is necessary to improve key techniques such as ultra-low noise measurement, ultra-high-precision quantum control and high-performance quantum chips and that these are integrated with high-efficiency quantum algorithms. 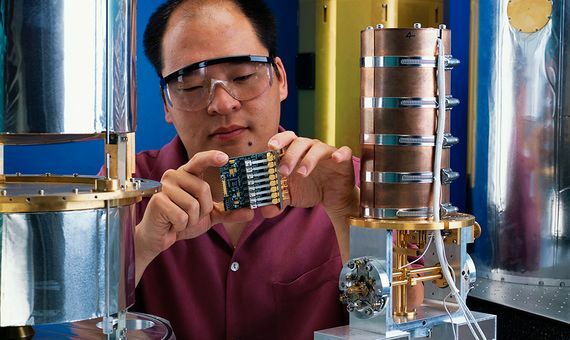 Last summer, the physicist broke the record for quantum teleportation by transmitting the quantum state of one photon on Earth to another located on a satellite in orbit 1,400 kilometres away. Here, NIST physicist holds a circuit used to amplify signals from a photon detector. Credit: Geoffrey Wheeler. From Europe, Blatt is wagering on interdisciplinary work, with technologies that go beyond what is available in universities, in other words, the support and participation from industry, which requires a lot of funds, dedication and engineering. “We can never beat physics by mere technology but we can always beat technology with better physics. Thus it takes physics and technology and, of course, this will cost some money and a lot of dedication. But we will get there eventually,” affirms the researcher.